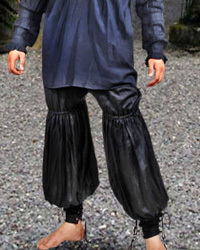 These Swordsman Pants are made of high-quality rayon viscose with elastic at the ankles and right above the knees, for a puffy look that is perfect for a Ren Faire pirate costume. Black only. See size chart below. To order, choose your size from the dropdown list, then click on the "Add to Cart" button.